The Plenty Highway is an outback road and mostly unsealed between north-western Queensland to the Stuart Highway in the Northern Territory. From Boulia in Queensland to Alice Springs is a little over 900 kilometers. Some say it is a fairly featureless and rough track, but the Plenty Highway is quite good if you’re travelling from Brisbane to Alice Springs, as it is the shortest route. Nevertheless, it is fairly slow going, and there is no doubt that it is an isolated part of the country. These are the roads we love as the isolation adds to the whole experience and we enjoy being self reliant. Vehicles you are considering taking across the Plenty Highway should be in tip-top condition, as any repairs in this neck of the woods will cost a veritable fortune… even if you are fortunate enough or could coax someone to come out and fix the problem! There are few facilities along this route so you need to be self contained, and carry enough spares to get yourself out of trouble. Also you will need to work out your fuel consumption carefully, particulary if you have a large juice guzzler. It always pays to have contingency fuel, and by that I mean having at least 20 litres (a gerry can) more than what is estimated. Besides being embarrassing, running out fuel is irresponsible at best, and downright dangerous at worst. 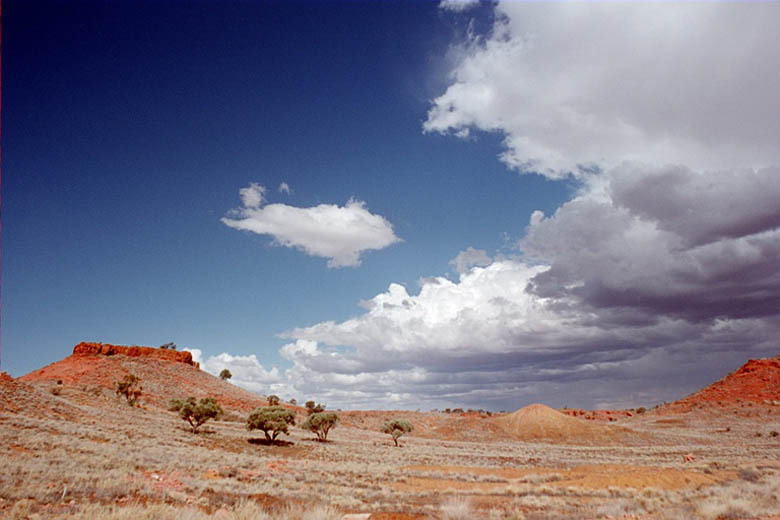 Traveling east, the road leaves the Stuart Highway 68 kilometers north of Alice Springs, follows the Sandover Highway for the first 27 kilometers and then heads to Tobermorey Homestead on the Northern Territory/Queensland border. 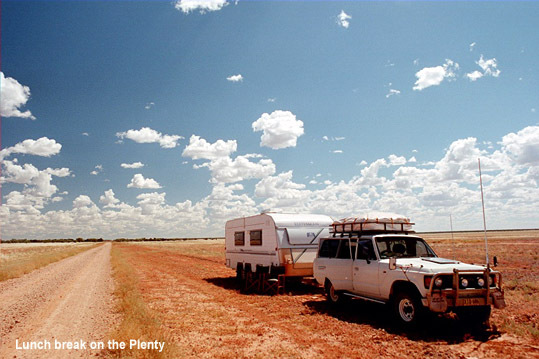 Although I have traveled the Plenty Highway twice with the van you see in the pictures, NRMA and others suggest the road is NOT suitable for caravans. So be warned. The road then continues on to Boulia, in Queensland, as the Donohue Highway. Our first trip across the Plenty Highway to took place in 2001 and the return trip was in 2002. I imagine that people will read this in years to come and the road will be quite different, so our trip is a snapshot in time. The first 100 kilometers from the Stuart Highway to Ongeva Creek is sealed. The remaining 178 km to Jervois Homestead is unsealed as is the rest of the track to Boulia. Information about the condition of the track may be obtained from the Harts Range police station, 112 km from the Stuart Highway. East of Jervois Homestead, the road is formed earth, deteriorating to rocks and bulldust as you near Tobermorey, 213 km from Jervois Homestead. The road north to Urandangi and thence to Mt. Isa bears left just before Tobermorey. As at other Northern Territory / Queensland border crossings, the Plenty Highway becomes pretty ordinary east of the border into Queensland. Travelers should be aware of deep potholes and bulldust. Road trains frequently use the Plenty Highway, so watch out for them. It is 242 km from Tobermorey to Boulia and good camping may be found at the Georgina River, at about the 125 km mark. Fuel and food may be obtained at Gemtree, Atitjere community, Jervois Homestead, Tobymorey and Boulia. Again, travelers should be warned that the Donohue Highway is not considered suitable for ordinary caravans and that road trains up to 53 metres in length use both highways.